A quintessential shortbread recipe revamped twice for two deliciously buttery versions of a classic cookie. Shortbread cookies offer delectably crunchy bites that still maintain the sense of a soft cookie. Using powdered sugar as the sweetener gives these cookies their appealing melt-in-your-mouth texture. A blog I follow, Smitten Kitchen, posted a scrumptious coffee flavored version of these cookies featuring a deep, chocolately finish. Her recipe included a clever trick of rolling out the dough in a zip top plastic bag and then allowing it to chill in the bag, making for quick and easy cutting of the chilled dough. I made a batch of her espresso-chocolate flavored cookies and then experimented with my own almond flavored version. How did these two recipes stack up? Deliciously! 4 oz of your favorite chocolate bar, chopped finely. I found one with toffee bits inside which worked fabulously. Thoroughly mix butter and powdered sugar in a medium bowl. Stir in coffee and vanilla. Mix in flour. Don’t overmix. Transfer dough to a gallon-sized zip top bag. Roll the dough out until it is about 1/4 inch thick. You should have a rectangle about 9 x 10 inches. Squeeze out the air and zip bag closed. Refrigerate dough for 2 hours. Refrigerated dough will keep for a couple of days. Cut the dough-filled plastic bag so you can remove top layer. Turn dough out onto a board. 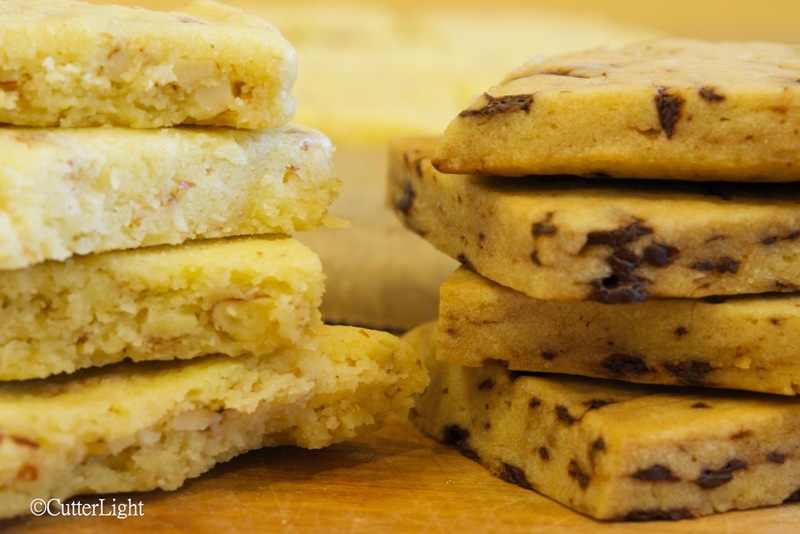 Cut dough into cookies – about 1 1/2 inch squares. Bake for 10 minutes. Then rotate pan and bake for additional 10 minutes. Cookies will taste best when they are fully cooled. 4 oz almonds, chopped fine. Nice to hear from you, Corinne! Hope all is well in Scotland. Just beginning to get cold here – first snow in the hills above Ulaanbaatar this past Saturday. Oh, I love shortbread cookies! these look sooo good! 😉 so glad to find your intriguing blog tonight. I’m following now too. Lived in the Yukon years ago and loved it. I’ll be back soon. Thanks Geraldine! Make sure to let us know how any of our recipes work out if you try them!